Sweet DoAheads! If you’ve spent time perusing some of these posts you know my “fetish” for two for ones. A 2fer makes my heart patter. No…its not OCD (Obsessive Compulsive Disorder) but rather PTP (Pursuing Time in his Presence) that motivates me. Today’s DoAhead Devo addresses one of the most amazing two for ones ever. He teaches us as we sleep! Confession #1. For years I thought this verse didn’t make sense so I never claimed it. Confession #2. The verse still doesn’t make sense to me. But now I know it’s what it’s supposed to be…a mystery. Did life circumstances make me desperate enough to claim the mystery? Perhaps. Has He given me the gift of increased faith? Perhaps. All I know is that this DoAhead woman fosters hearing from Him in the evening any way she can! How do you promote “instruction at night”? 2. Devotional or prayer book on the nightstand. Reading from a source like this creates lingering thoughts focused on Him. 3. 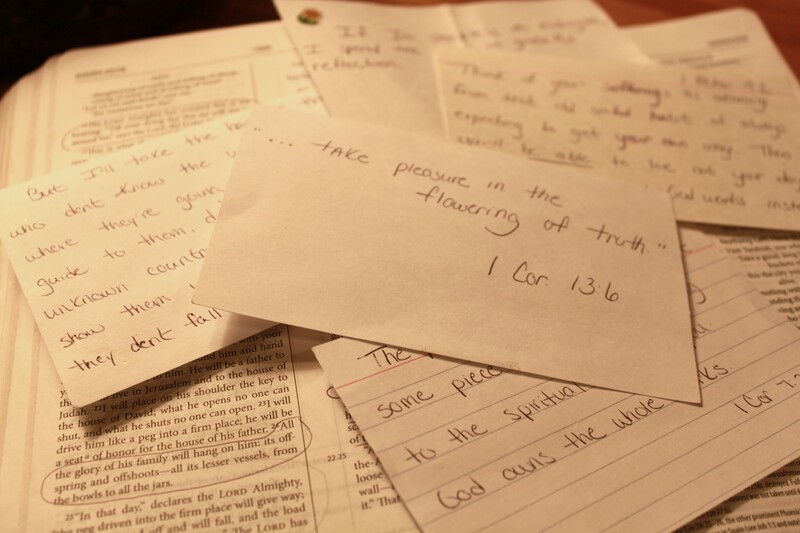 Keep recipe cards of verses that He’s been using or that we want Him to use on our nightstand. 5. A relaxing walk or yoga routine late in the evening. Regardless of how we pursue it may we do it!